Today we had a great team of gardeners planting in the central garden!!! Together we planted 300 flower seeds, 100 bulbs - and 1 rosemary bush!!! Many thanks go out to Amy, Cyprus (even with a broken foot! ), Denai, Sennur, Safiri & Shanthi for getting stuck in and planting all of that. But thanks also to everyone who came out to say thanks to the gardeners - we even got a round of applause from Zoula. It really does make a difference to know that looking after the square is appreciated by everyone else! (I hope I've spelt everyone's name correctly - please make a comment to correct it if it's not). She suggests that we make it a regular Monday afternoon gardening event! Well - what does everyone else think? Let's try it for the next few Monday afternoons - say 4.00pm (only if the weather is good!) - and that way everyone can have a snack after school & then come & join us. But - hey!!! Thanks to everyone who turned out today - either to garden or give encouragement - we all had a great day!! Our youngest gardener in Leabank Square - is also the best gardener!!!! Denai - you are an absolute STAR!!!! There was simply no stopping you!! Thank you for digging, raking, planting, removing dog poo weeding, covering - in fact - just about doing ALL the work!! We all know that the residents who live in the houses are some of the luckiest people on earth. They all have amazing gardens to the rear of their properties. But the majority of us live in flats with a tiny (what is called a) Juliet balcony for a garden. Some of us try & make that a bit nice by having a window box or two - but it isn't the same as a real garden now is it?! But we all have communal areas - and if anyone wants - how about putting a lovely pot plant out for all to get joy from? Remember to set your clocks one hour forward today - especially if you have to go to work early Monday morning!! Hey all you Leabankers!!! The new travellers site at the beginning of Wallis Road is finally complete & our new neighbours have all moved in!! I know that many of us met our new neighbours at the series of meetings at the community centre over the past few months - well - now we can finally wave to them as we go over the footbridge to Viccie Park!! The new development looks a bit concrete at the moment - but you must just hear the exciting plans everyone has for the gardens!!! It is soon going to look like an oasis!! 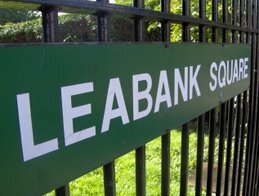 Anyhow - we will all be able to meet each other in a more relaxed way in July as Leabank Square has invited our brand new neighbours over for a barbie!! Watch this space!! Here's the new edition to our Leabank Square garden. A few days ago we planted two cherry trees next to the re-cycle bins in the middle of the square & guess what?! They're already starting to blossom!!!!!! In a few short years we will have fantastic huge cherry trees shading our re-cycling area & giving the boring re-cycling bins some much needed colour. Oh - by the way - if anyone else is interested in planting any more fruit trees in Leabank Square (or around Hackney Wick) - we bought these from Lidl in Well Street - for only £3.99 each!!! What a bargain! Just to let all know that the amazing Hype purple mobile internet/computer/gaming bus has changed from coming on Tuesday evenings - to Saturday afternoons. Please check out http://thehype.info/ for more info about all the great services this fantastic bunch of people offer. HYPE - Hackney Young People Empowered - is the Hackney Youth Service’s website created exclusively for young people by young people. The website is here to give you a place to post your own material and to let you know about services and information you may need. And the bus - or is it - truck(?) has got everything your kids need to have a great Saturday afternoon! Keir & his crew create a safe, fun & great vibe just to hang out in. Spring has Sprung in Leabank Square!! Anyone remember last years two abandoned mallards - well - they have grown up now - and still come for a bit of food every day!! You cannot escape the blue wall of the Olympic Site! It seems to be seen form all over Leabank Square. For those of us lucky enough to be able to see over the top - it all seems to be moving along at a fast pace. Sometimes not everything goes well. As some of us can vouch for - sometimes there is just too much dust & noise coming over the Big Blue Fence. This is inevitable! It's a massive building site - and it's gonna be a cracking Olympics venue when it's done. But - if there is something that is upsetting you - then please know that there is a fantastic team on the other end of a phone who will get things sorted out as quick as they can. We have had very dry sand mountains sprayed with water within an hour in the very dry weather; we've had very noisy machines quieted down as very short notice; we even had a faulty alarm on the Sand Washer (that massive yellow machine) switched off at 3.00am on a Sunday night. This line is answered at any time of the day or night - and swift action will be taken. As I said - they have always done all they could to make Leabank Square's life a lot easier. Spring is springing - and that can only mean one thing! Time to get those barbies out again. Please keep checking this blog-site to see when any residents will be inviting you to our communal barbies. These are such amazing relaxed & informal ways to get to know your fellow Leabankers. If you yourself are thinking about having a barbie in one of the communal areas of the square - please consider letting everyone else know about it. All it needs is a mention here - and we can all get some sausages & salad out of our kitchen - and come along & join you! Some of us attended an amazing workshop down at the community centre a couple of weeks ago! Needless to say - there is LOADS to report back - but in a nutshell - Louise Francis & the incredible team at london21.org - are trying their bestest to get some community spirit going for the whole of Hackney Wick & surrounding areas!! So what does this mean for us Leabankers? Well .......... it's all at the beginning stages - but soon we can all have an input into what we love about, loathe about, are worried about, want to contribute our views about, want to shout about, want to find out about, anything about Hackney Wick!! How - well - this team are building a web-map of our neighbourhood with just about all you could ever want to know about it - it's history, its future, its facilities, its amazing people (you! ), its plans, etc. Until we get a bit further down the road with the web-map - wet your appetite by visiting their web-site: http://www.london21.org:80/ and check out how far the Hackney Wick map has come along at: http://www.communitymaps.london21.org/includes/MiniSiteHackneyWick.php. And please keep a look out for any updates to this exciting new venture for ALL of us - right here on this blog. Also please feel free to comment on this as well!! If anyone is interested in joining some Leabankers in some gardening this spring/summer - please leave a message (& your email address)in the comments section. We want to make Leabank Square as colourful & scrumptious (tomatoes, runner beans, etc) as possible! !